Edward J. Rielly is a master poet. 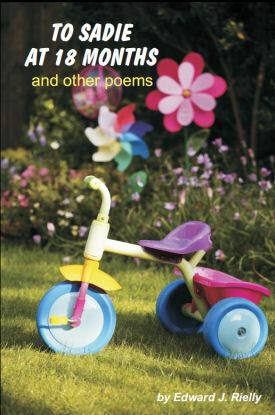 His latest book, To Sadie at 18 Months and Other Poems, celebrates the birth of his granddaughter in a manner that allows the reader to participate in this joyous event. Behind, in between, and in all of his words, Rielly interconnects his subject with universal themes. True, there is a sweetness throughout these pages, but it is made not of sugar, but of love and truth in all of their manifestations. I highly recommend this book. Edward Rielly offers visual snapshots of the wondrous journey of family. His sharp observations of the everyday magic of childhood offer readers a glimpse of the simple joys and various rewards of parenting and grandparenting. A treasure to read. It is often said that writing tanka about one's own grandchild is very difficult but Edward J. Rielly, who is one of the accomplished tanka poets in GUSTS, succeeded in writing about his granddaughter, Sadie, with controlled expressions of love. These tanka are filled with lyricism.